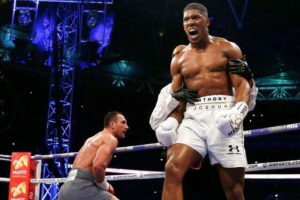 Following his April 29, 2017 knockout of Wladimir Klirschko, White was quick to praise Joshua as the next big thing. In a recent interview White announced that he would not be looking to cross over fighters on the UFC roster to fill boxing cards. Joshua is the one boxer that White showed interest in working with. “In my opinion he’s the most marketable guy in boxing,” White told reporters. With an arguably declining roster of “star power” heavyweights in the UFC it is no surprise that White has been scouring for new talent that he can build up. One of the most prominent parts of the interview was the conversation about development of stars for Zuffa Boxing. The UFC has a positive reputation for building up their top fighters, making them marketable with interesting backstories, creative visuals and constant exposure. White looks to accomplish the same for Zuffa boxing. Anthony Joshua is the holder of heavyweight titles for the IBF, EBH and IBO. He is also a 2012 Olympic Boxing Gold Medalist. Unifying the heavyweight title is the first goal for Joshua. To do so he is going to have to go through some heavy hitters. WBO titleholder Deontay Wilder and WBC titleholder Joseph Parker are on that list. Earlier this week UFC President Dana White opened up about some of his plans for Zuffa Boxing. It is no secret that White is planning on stepping into the world of boxing under the umbrella of UFC parent company WME-IMG, which is also home to the Zuffa brand. Speculation about the transition to boxing has been floating around since this summer when White first appeared in interviews wearing a “Zuffa Boxing” t-shirt, produced by Reebok. White has confirmed that he will be promoting boxing and maintained an air of confidence as he spoke at the media luncheon hosted at the UFC Headquarters in Las Vegas. One of the questions that has been on the minds of fans and fighters is whether or not the UFC and Zuffa Boxing athlete roster will be interchangeable. There are a number of current UFC fighters who have boxing experience and have vocalized interest in putting on the big gloves. When asked if he would be pulling from the UFC list of athletes, White replied, “No. I’m not thinking about that. I’m not saying it could never happen, but that’s not what I’m looking to do.” He also specified that UFC Champion Conor McGregor, who made his boxing debut against Floyd Mayweather Jr this summer, was included in that statement. Making it clear that he would not be bringing over UFC fighters leaves the question on who will be appearing in the Zuffa Boxing ring. White was asked if cards would be similar to the UFC format and he confirmed that they would and emphasized that having quality fights throughout the whole card is important. “Seats are empty until the main event starts,” asserts White, who also told reporters that he was guilty of that as well. The only fight he watched on the Mayweather v McGregor card was the main event. What’s Next for Zuffa Boxing? White asserts that he will be taking a whole month at the beginning of the year, to meet with various people in the boxing industry and figure out his plan. He also stated that he has a plan A and a plan B. He just has to figure out which to go with. 2018 may prove to be an interesting year for boxing. UFC President Dana White is has masterfully kept fans and fighters on the edge of their seats waiting to see what the next move will be for the UFC. 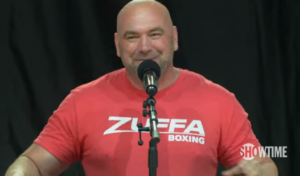 Rumors of a boxing promotion have been floating around since White first appeared at an interview wearing a shirt baring the logo “Zuffa Boxing.” Zuffa is a subsidiary of the UFC conglomerate and the former parent company of the promotion prior to the acquisition by WME-IMG last year. There is no question that they UFC has done an amazing job in branding the organization and fighters underneath the promotion’s banner. For the general non-fan, the UFC is still a familiar acronym while Premier Boxing Championship, Top Rank or the like are much less likely to be recognized by the masses. It is safe to say that even in the boxing industry, most competitive boxers could tell you what the UFC is, while many MMA fighters would be hard-pressed to list boxing promotions. Making an entire fight-card engaging from top to bottom is another area where the UFC excels. Last weekend’s UFC 217 was one of the most exciting cards in recent history starting all the way from the bottom of the card on the UFC Fight Pass early preliminary fights to the Pay-per-view main event (Georges Saint-Pierre v Michael Bisping) at Madison Square Garden. Boxing is known to have their cards stacked top heavy with lower payouts for earlier fights, corresponding heavily with anticipated lack of attendance and viewers for those bouts. There are generally not promoted with any significance and it is a given that most fans will show up or tune in specifically for just the main event. The minimum amount that a UFC fighter is guaranteed is $10k to show up and $10k to win. More on this in BoxingInsider.com’s previous breakdown of the difference in fight purses here. The UFC is the top of the industry in MMA. Serious competition is minimal. In boxing the playing field is a bit more even and promoters are decently outspoken against each other. As the voice box for the UFC, White has not been known to hold back his thoughts. From an outside/fan perspective, this could make things interesting. Just in the short time White has been active in the boxing world he has delivered the clear message that boxing needs help. That message has not consistently been well received, especially by established industry professionals such as Bob Arum of Top Rank Boxing. The name Zuffa is well known to the majority of MMA fighters already. And it is very plausible that the company could build the boxing promotion under that title. There is a lot of potential in-house talent that have already vocalized a desire to make the cross over to boxing. Some of these current UFC fighters include Jose Aldo, Stipe Miocic, Jimi Manuwa and Cris Cyborg. There are countless other UFC fighters and other Mixed Martial Artists across various promotions who have competed as boxers at some point in their careers (Holly Holm, Joe Duffy, KJ Noons, Vitor Belfort to name a few), but found MMA more profitable at the lower levels. With an option to climb the ranks in both sports, this could open up a lot of potential crossover. How that crossover would look will take a bit of effort from the contractual standpoint of the UFC’s legal team. •	How Soon is it Coming? The UFC was not built in a day. The company is known for taking chances and trying new things, but there are licensing and regulatory hoops to jump through before WME-IMG can enter the world of boxing. The Conor McGregor boxing match against Floyd Mayweather Jr. earlier this year was a baby step for the company to get their feet wet. It should still take some time to set all of the legal and regulatory aspects of boxing in place, obtain licensing, competitors and to learn the ropes (rather than the cage). Given the UFC’s ability to put the right people in the right places, mid next year would be reasonable, though White has surprised us before . 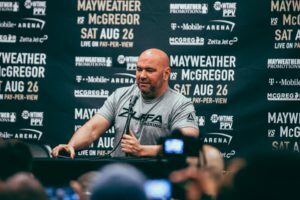 . .
Will Dana White and the UFC be the Next Big Players in (Zuffa) Boxing? “I could see bringing boxing under our umbrella and trying to see what we could do with that. I could see doing that.”-UFC President Dana White. As written about by BoxingInsider.com following Floyd Mayweather Jr fight versus UFC Champion Conor McGregor, there may be something to the “Zuffa Boxing” t-shirt adorned by White during pre-fight interviews. Zuffa, LLC. sold the UFC to WME-ING last year, though the Zuffa brand is still heavily associated with the promotion. White was interviewed on the Wall Street Journal’s “Unnamed Videopodcast,” where he was questioned about the possibility of a UFC crossover to boxing. Though vague in his response, White alluded to the fact that it could happen. His answer seemed to have been worded to imply that he had not given serious thought to the concept, but would Reebok already be selling “Zuffa Boxing” shirts if something were not something in the works? No stranger to the boxing world, White spent a lot of his early combat sports industry career in that sector. White trained in boxing, taught boxing and had his own boxing brand. The Mayweather / McGregor fight grossed in the neighborhood of $600 million. That is certainly enough to grab the attention of new UFC parent company WME-IMG, whose fairly recent acquisition of the company could mean a lot of changes to the structure and operations of the business. Who is to say one of these changes couldn’t include the addition of boxing under the UFC conglomerate. It is common knowledge that there is a discrepancy between what MMA fighter and boxers are paid. The top purse reported in MMA has Ronda Rousey (UFC 207) and Conor McGregor (UFC 202) tied at $3million with Brock Lesnar (UFC 200) a fairly close second at $2.5 million. These payouts do not include Pay-per-view percentages or any other bonuses. In contrast, the top for boxing is Floyd Mayweather Jr who took home $100 million just for his purse alone, against Conor McGregor. Mayweather does tend to be the exception, taking home far more than most other top-tier boxers. It is hard to take Mayweather out the equation when talking about top-paid boxers. Of the top seven grossing matches of all time, he was a participant in at least four. When Manny Pacquiao fought Mayweather in 2015, the PacMan came home with $120 million. In September, the highly anticipated Miguel Canelo and Gennady Golovkin bout boasted a purse of $15 for each fighter, before the 60 percent PPV split. The PPV and other bonus can add millions on to each purse in the boxing industry. That being said, the cream of the crop in boxing obviously grosses significantly more than its MMA counterparts. The bottom tier may be a different story. The UFC minimum purse for any card is $10k to show and $10k to win. Unlike most boxing promotions, purses are usually offered at a flat rate with a win bonus that equals the same amount. This provides added incentive for an athlete to preform to their highest potential. Some lower promotions like Victory Fighting Championship (broadcast on UFC Fight Pass) have been known to offer “finishing bonuses” to fighters who end the fight rather than letting it go to the judges. In a stark contrast to the UFC minimum, the opening bout for the Mayweather/McGregor card did not even amount to $10k between the two fighters. This may also have to do with the fact that rounds were significantly shorter for Savannah Marshall ($5k) and Sydney LeBlanc ($3.5k). The first 12 round fight on the card was Andrew Tabiti ($100k) against Steve Cunningham ($100k). The UFC minimum is not the industry standard. Bellator MMA may start an undercard fighter at $1,000 to show and $1,000 to win, while small regional promotions may be as low as $200 and $200. This is not unlike smaller boxing promotions. Overall it can be said that top tier boxers currently have the opportunity to make significantly more than MMA fighters at the highest levels, while the pay is probably more even overall at the lower levels. In joining the boxing community, the UFC will have significantly more competition than the promotion is use to. This is unlikely to dissuade the UFC, given that they are very good at what they do and will undoubtedly be competitive in the current mix as far as the promotional aspect is concerned. Some of the top competition in the boxing world include; Top Rank, Golden Boy, Premier Boxing Champions, K2 Promotions, Dibella, Mayweather Promotions (TMT), Roc Nation and the recent addition of the successful British promotion, Matchroom. These promotions host their events across a number of high-profile broadcast networks such as HBO, Showtime, ESPN, CBS, NBC, Fox, FS1 and more. The UFC currently airs its “Fight Night” events, which are not PPV, on FS1. Premier Boxing Champions is the boxing promotion featured on FS1, which could mean someone would need to find a new network if the UFC started promoting boxing events frequently. This would be less likely in the immediate future as the UFC would probably start out with a few PPV events to test the waters. The UFC already has a huge audience in the MMA world. It is very likely that a good number of these fight fans would follow the promotion into the boxing arena. As evident in the Mayweather/McGregor fight, the UFC has the ability to reach a broad demographic. With decades of steady promotions and marketing strategies, the UFC has already mastered the promotional aspects of creating a successful event. They do an incredible job of pre and post fight media, using an adequate but not overbearing amount of dramatization to draw fans in to the personalities of the competitors. Like any good TV show, movie or book, knowing the compelling backstory of an athlete inspires fans to feel more connect and more motivated to watch. This type of professional and methodical approach to promotion may be what boxing needs to make a comeback in the U.S. where it is still less popular than in other regions. McGregor is not the only MMA competitor who has shown interest in boxing. There are a good number of athletes who already compete in both sports. UFC athletes Jose Aldo, Stipe Miocic, Jimi Manuwa and Cris Cyborg have already voiced interest in wanting to box. If allowed to compete in the ring, those names would undoubtedly draw a crowd. The hang up on which promotions boxers compete for could potentially ride on the payout, which it should. No one is looking to get punched in the face for free. As extensively discussed earlier, the high-end payouts for the UFC are still significantly less than that for top boxers. The UFC may find that they have to cough up more to compete for athletes in the industry. Depending on the PPV and gate numbers, this may be worth it, as many large boxing cards have draw a much bigger crowd and PPV turn-out than UFC cards. The other question is whether or not the UFC would put their boxers on an official roster with the same ancillary rights agreement that their MMA fighters are subject to. This could also make a difference in the caliber of athlete they acquire. About this same time last year Arum told media outlets that he met with Ari Emanuel (owner of UFC parent company WME-IMG) who was interested in purchasing Top Rank’s fight library for $100 million, which includes iconic fights such as 1975’s “Thirlla in Manilla” between Muhammad Ali and Joe Frazier. Though the conversation did not go anywhere, the library would have been an addition to the extensive classic fights available on UFC Fight Pass and a soft introduction into boxing for UFC fans. A long-term deal with ESPN has since been inked for rights to the library. In the recent interview with NYFights.com Arum stated that he was contacted last year by someone in the UFC wanting to purchase Top Rank. It was unclear if Arum was referring to the entire promotion or the previously mentioned attempt to purchase the library. The UFC is know for successful acquisition of other promotions, though up to this point they have all been MMA only promotions. Allowing McGregor to compete in boxing earlier this year granted the UFC businessmen and fans to acquire a taste for boxing without shoving it down their throats. This has sparked obvious interest from fighters and there are a lot of MMA fighters out there with great hands who could be fun to watch. Will we see a UFC boxing card in the near future? Overall it makes a good deal of since. The UFC already knows the formula for success in combat sports. The company has already gotten its feet wet. Fighters and fans are watching anxiously to see what the UFC’s next move will be.